Jeff Grosso has a new show coming to Offthewall.TV and it's about anything he wants it to be about. It's a about time ... Is it like cable access?” “It’s below cable access”. 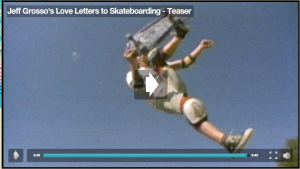 Jeff Grosso has a new show called LOVE LETTERS TO SKATEBOARDING and the guys (Buddy and Rick with artist Dennis McNett ) at Six Stairs are doing it with him- if you don’t know who Jeff Grosso is, well where were you during the past 30 years???? Check isTia for complete coverage and pictures. So, Jeff has this new board with Antihero, he has this brand new show on offthewall.tv, he has this big worldwide launch at Joker’s this weekend. What’s next? I would say, Grosso for Prez.